Gubernatorial candidate Mark Dion speaks at the Democratic convention, Saturday, May 19, 2018, in Lewiston, Maine. When it comes to elections, Mark Dion has a history of taking risks. In 2010, after eight years as Cumberland County sheriff, Dion gave up the position to run for the Maine House, and won the seat by 20 percentage points over his Republican opponent. 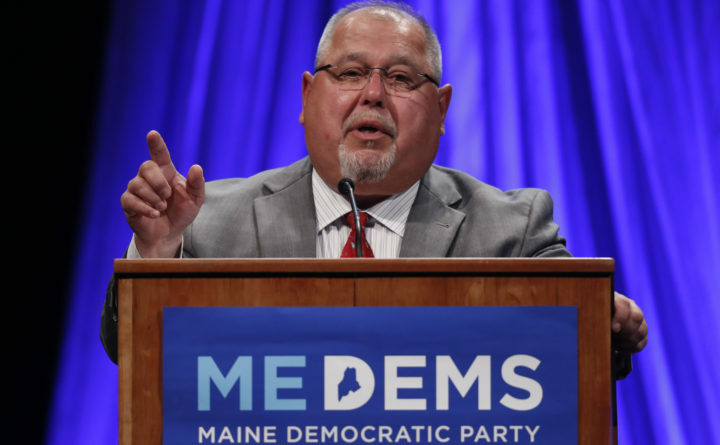 In 2016, even though another House term was possible under Maine’s term limits law, Dion ran for the Maine Senate and trounced the opposition with 71 percent of the vote. Now, Dion is vacating a Senate seat that could be as safely his as any seat in the Legislature so he can run for governor in a field of seven Democrats vying for the nomination. Indicators about how the race is going — mostly fundraising totals and the one public poll released last month — say Dion is not among the leaders, meaning his 20-year run as an elected public servant is at serious risk. Dion, 63, is entrenched in the progressive wing of the Maine Democratic Party and was a public and vocal member of 2016 progressive presidential candidate Bernie Sanders’ “kitchen Cabinet.” Sanders topped rival Hillary Clinton in Maine’s caucuses, laying bare the state’s progressive streak, yet Dion’s campaign falters. One factor could be the other progressive Democrats in the race, though Dion wonders what might have happened if he’d entered the race sooner than he did, in October 2017. At the time, there were already nine other Democrats running. “There’s an available pool of money out there in the traditional arena and many of my colleagues got to it before I did,” said Dion, who has raised only about $42,000 — many times less than several of the other candidates. In his campaign, Dion has been open about his goals, such as a public insurance option for everyone, more robust infrastructure spending and far more resources to curb Maine’s opioid addiction crisis. Those are goals common to a lot of candidates, but Dion is uncommon in that he reminds voters frequently that those goals will require tax increases. That’s not something candidates often emphasize. The primary campaign waning doesn’t mean Dion is done with surprises. During a WMTW Democratic debate on Tuesday, Dion said for the first time that he favors the creation of legal injection sites where people who are addicted to drugs can inject themselves under medical supervision and in a place where treatment services are available. He said it’s a position he evolved to over time, knowing it surprises some of his supporters. He compares it to when he was one of the early supporters of legalizing medical marijuana. Another hard question Dion answered through a progressive lens was whether Bath Iron Works deserved a $45 million tax break, which was the subject of a bill earlier this year that eventually passed. Dion voted against it. “The progressive wing wouldn’t give [BIW parent company] General Dynamics their tax breaks. Those millions of dollars should have been put into infrastructure in the Bath region,” Dion said. These may look like marginal or extreme positions to some, but they have support, including from some of Dion’s legislative colleagues. Former Portland mayor Michael Brennan, who has worked closely with Dion on a number of issues, said he is supporting Adam Cote in the governor’s race but respects Dion. There’s a long road to the general election, and even if Dion isn’t there for the ride, it could be important for him, especially if Democrats extend their majority in the Legislature and Mills wins the governorship. Dion, an attorney, is among several people mentioned among prospective prospects to become Maine’s next attorney general. Dion said he has heard the rumors. His strength, he says, is understanding that progress is slow.